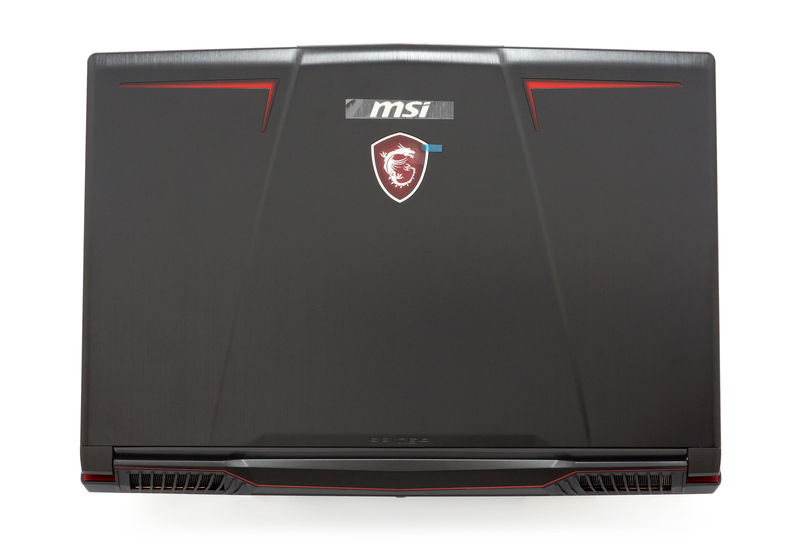 MSI’s Raider line-up of gaming notebooks is probably the most refined of all the devices the company offers. 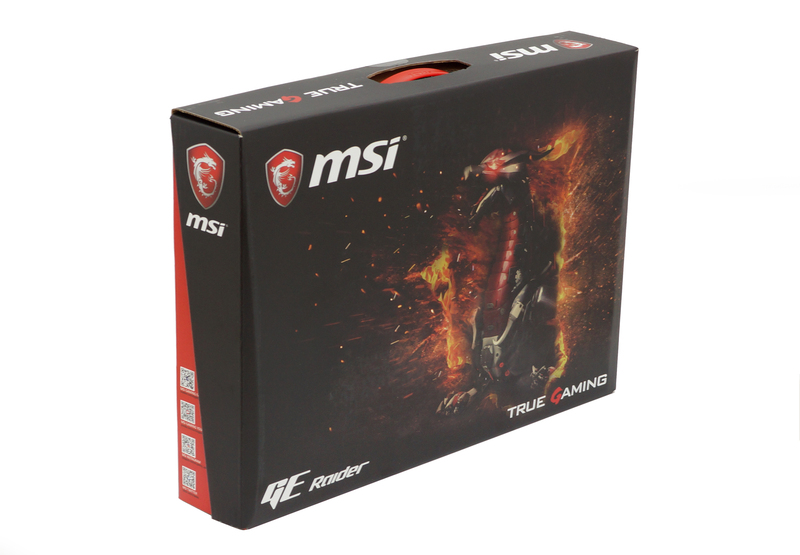 They employ fast and powerful hardware, input devices which are of very good quality and also a 120 Hz Full HD monitor while keeping the temperatures adequate inside a thin form factor. We certainly like where the gaming laptop industry is going and we are looking forward to introducing the MSI GE63VR 7RF to you. 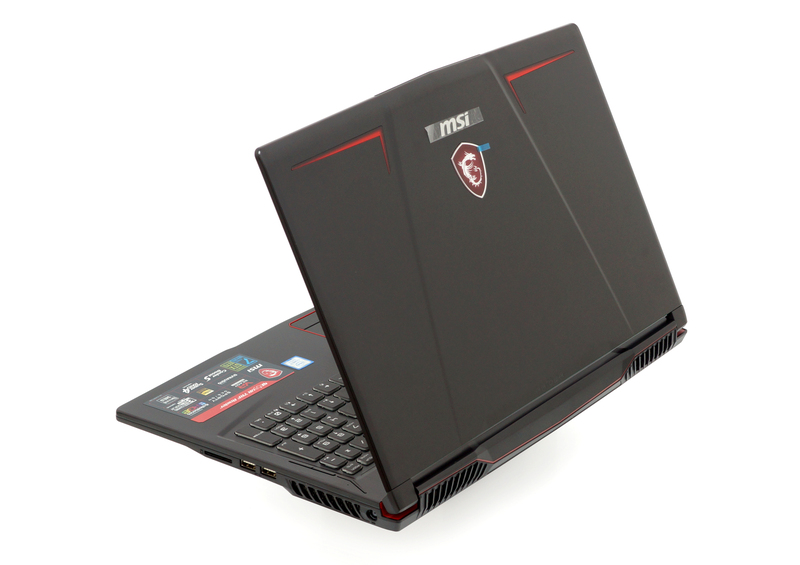 Actually, some time ago we showed you the 17.3-inch version of this very laptop, which is similarly named as MSI GE73VR 7RF. Both of them feature 120 Hz Full HD screens and a combo of Intel Core i7-7700HQ and GeForce GTX 1070 onboard. In addition to the remarkable hardware, we have RGB backlight under Steelseries certificate. This device also bears a “VR” branding which, according to the company, verifies that the laptop is good for Virtual Reality content. We are going to directly compare it to its larger brother and more precisely, we are going to check how temperatures change, when you decrease the amount of available space inside the machine. Inside the colorful box, there are two smaller boxes surrounding the device. Opening them reveals that one of them holds the cable that plugs into the wall, and the other one holds the charger itself. Beneath the laptop, which is put in a safety bag, there are a couple of the usual manuals and guides as well as a driver disk. 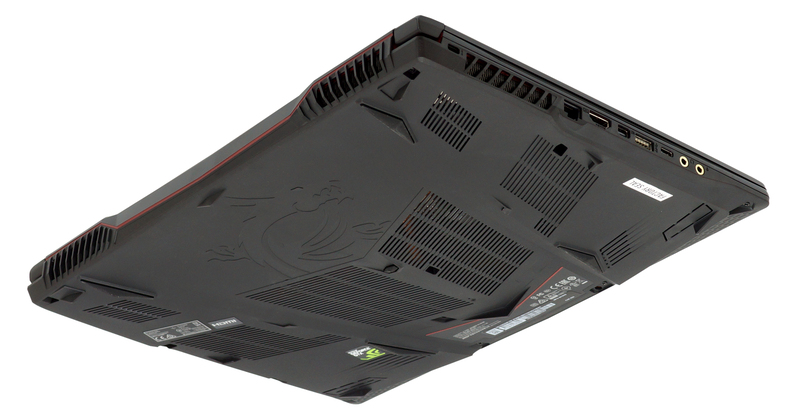 MSI has opted to use aluminum for the lid cover and the surface area of the GE63VR 7RF. Visually it is an almost complete copy of its larger brother although it’s smaller (obviously) and measures at 383 x 260 x 27 mm (15.08″ x 10.24″ x 1.06″) and weighs 2.2 kg, which while being heavier than the benchmark – MSI’s own Stealth Pro series, is pretty light for a GTX 1070-equipped notebook. Thankfully, it lacks severe bending on the display when exposed to torsion load. The lid can be opened easily with one hand. Doing so reveals the keyboard and touchpad of the device. Here are also present the trio of buttons of which the northernmost one turns the device on/off. The second one is dedicated to the Dragon Center utility, while the last one pumps the fans to 100% to give you a maximum cooling performance. Once again, the keyboard is illuminated by RGB LEDs by SteelSeries, which are programmable by MSI’s application. Keystrokes are tactile and fast, making typing experience pleasant. The touchpad is good enough, supports Microsoft Precision drivers, although it has Synaptics engines on top of it. It also has its keys separate from the touch area. This laptop’s I/O include an RJ-45 connector, HDMI and Mini DisplayPort, one USB 3.1 Type-C and one of three USB 3.0 Type-A on the left, accompanied by two 3.5 mm audio jacks. On the other side are located the other two USB 3.0 Type-A ports as well as the SD card reader. On both sides as well as the rear there are exhaust vents for a total of four heatsinks. As you can see from the picture of the bottom of the device we shared with you earlier, you can peek inside through the huge vents. 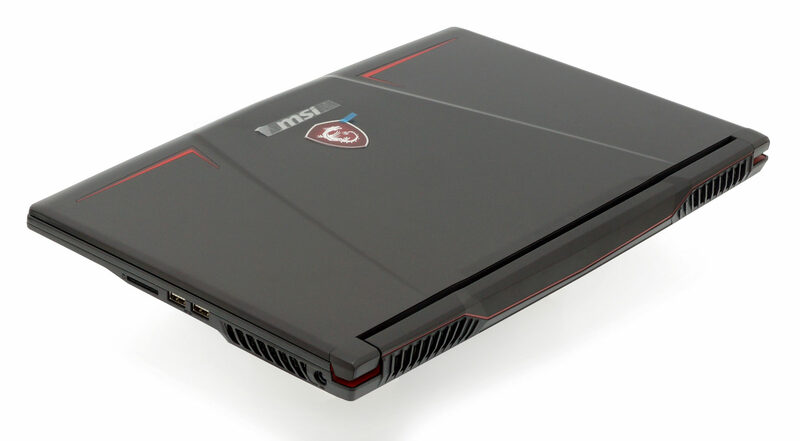 If you want to upgrade RAM or storage you need to open the MSI GE63VR 7RF, as the manufacturer has not provided a service cover. To do so, you have to unscrew 11 Phillips head screws and than carefully unclip the bottom cover with the help of a plastic tool. 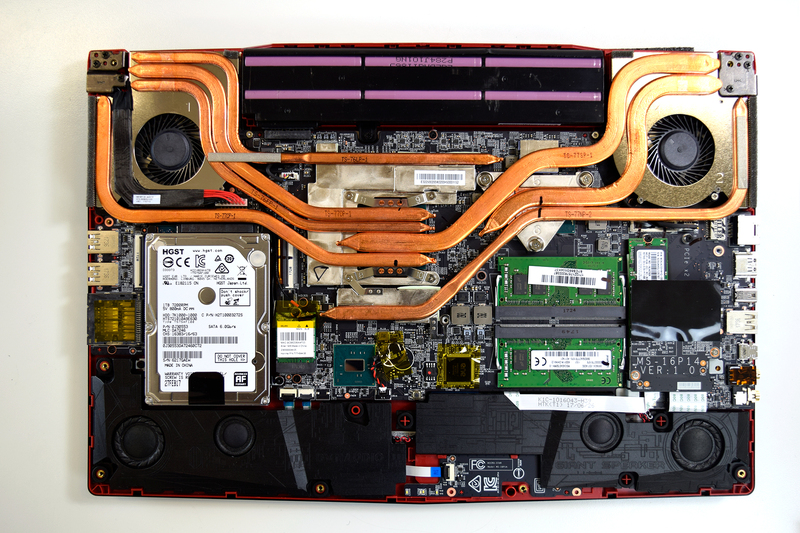 You can see the complex cooling solution, which comprises a total of seven heat pipes and four heatsinks. Appart from the Core i7-7700HQ and GTX 1070 those heat pipes also cool their respective VRMs and memory modules. On the top of this photo, you can see a simple configuration of cells inside the 51Wh battery. In the following image, you can see the Hard drive as well as the Wi-Fi adapter and one pair of speaker and woofer combo. Here you can see a total of two RAM DIMMs currently taken by 16 GB of DDR4-2400 modules. 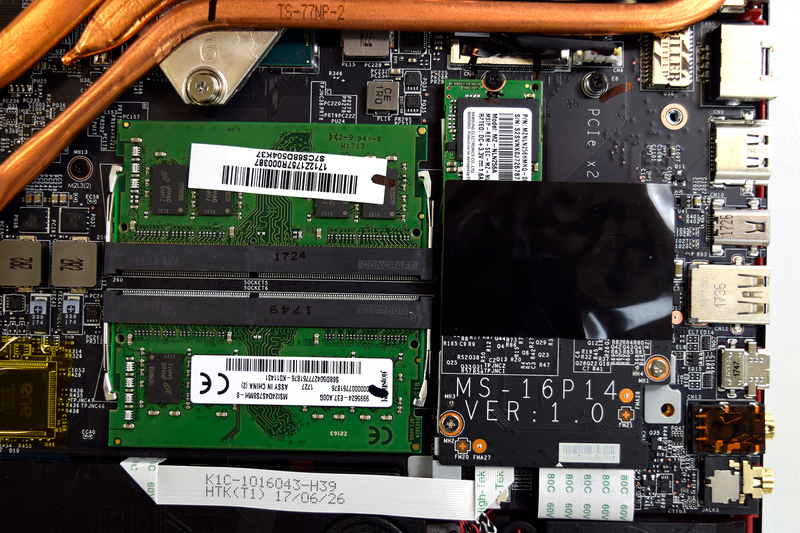 There is also the same amount of M.2 slots, which support PCIe NVMe drives in RAID 0. They are located underneath a PCB that controls the RGB array of LEDs beneath the keyboard. 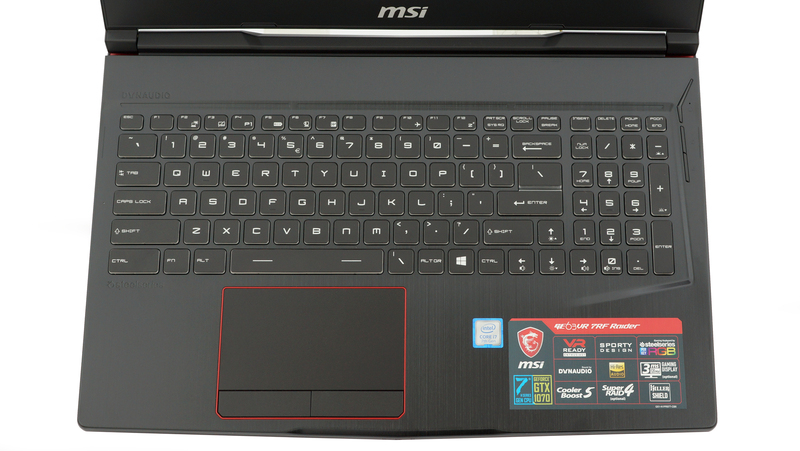 MSI GE63VR 7RF has the same display that the company put on their 15.6-inch GS63VR 7RF Stealth Pro notebook – the Chi Mei N156HHE-GA1. 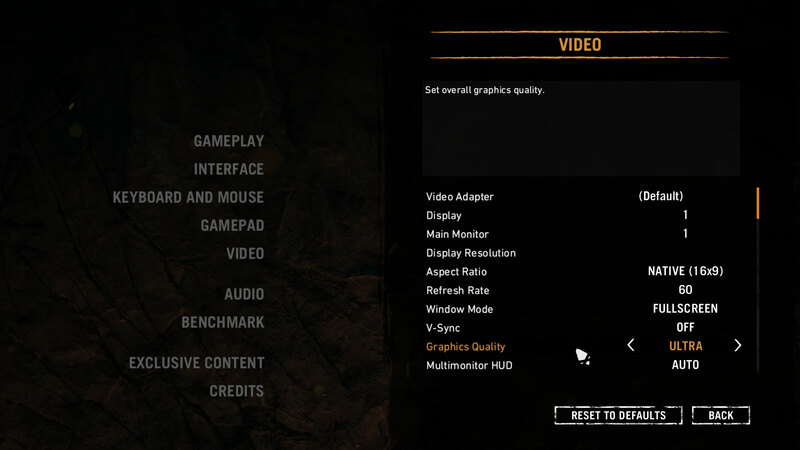 It has a 1920 x 1080 resolution and runs at 120 Hz. The pixel density of the screen is 142 ppi with a pitch of 0.18 x 0.18 mm. This means that the screen can be considered as “Retina” when viewed from further than 60 cm. Viewing angles are quite uncomfortable. We’ve recorded a peak brightness of 351 nits in the center of the screen and 328 nits as an average across the surface with an unacceptably high maximum deviation of 21% in the lower right corner (falling to 280 nits). The correlated color temperature at maximum brightness is quite cold – 7650K and it goes even further away from the optimal 6500K as we go along the grayscale – 14000K – rather bluish light, which is fixed by our profiles. You can see how these values change at 140 nits (42% brightness) in the image below. The new TN panels that MSI puts on their devices are exceptional. They provide super vibrant colors that cover completely the sRGB color gamut and spread further into the DCI-P3 to cover 96% of it. 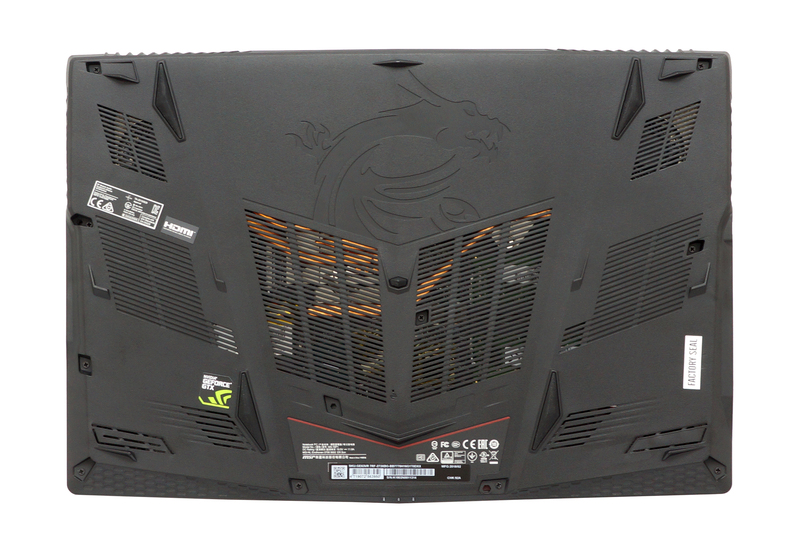 We recorded Fall Time + Rise Time = 8 ms – super fast panel, surely going to appeal to the gamers. 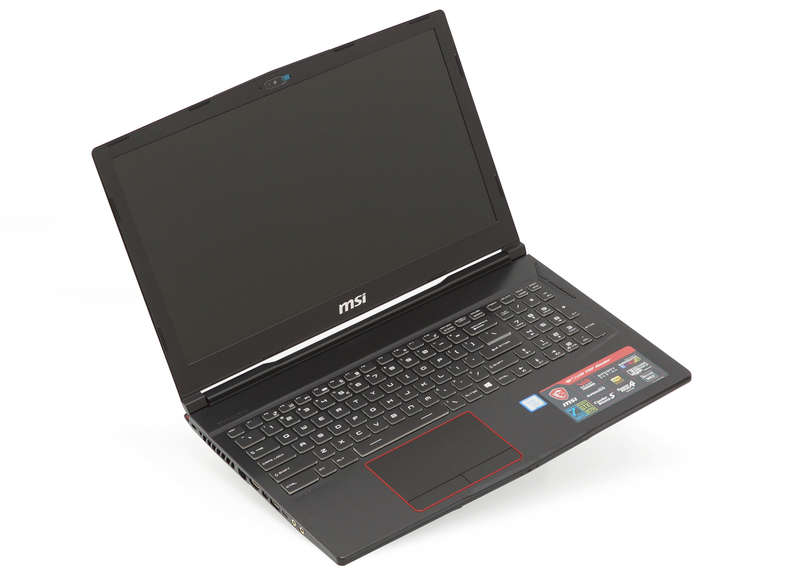 MSI GE63VR’s display uses PWM to adjust the brightness of the screen up until 95 nits. However this is done with a very high frequency that doesn’t particularly affect the eyesight in that aspect. This display is definitely meant for gamers. It boasts with 100% sRGB coverage, extending even into the DCI-P3 gamut, which means that you get super colorful and vibrant image, very rarely achievable by a laptop screen. Also there is no harmful PWM in use here, being easy on the eyes. In addition the panel is one of the fastest on the market and the high contrast and brightness make it a jewel. The only drawback of this screen are the poor viewing angles, which is inevitable due to the TN nature of the panel. MSI GE63VR 7RF sounds really well. Its two regular speakers and two woofers pump loud crisp sound (for a laptop), which is clean in low, mid and high-frequency ranges. As always, the battery tests were run with Windows power saving setting and Wi-Fi turned on, and the screen brightness adjusted to 120 nits. MSI GE63VR 7RF shares the same battery style as its larger brother, featuring 6 cells and a total capacity of 51Wh. This was enough for just three hours and 44 minutes of web browsing and 3 hours and 20 minutes of video playback. The 120 Hz screen drains the battery so fast, that you’ll get just over an hour of gaming experience if you actually try gaming away from the plug. MSI GE63VR 7RF is equipped with a 1 TB HDD and 256 GB Samsung PM871A SATA SSD. Since it is a SATA device, it won’t be the fastest device on the market, but with 541.7 MB/s Read and 511.3 MB/s Write speeds it proves to be on par with the supply on the market. While being smaller and housing a lot less space than the GE73VR (the big brother), GE63VR managed to even slightly outperform it. The performance was typical for a GTX 1070 unit – nothing short of brilliant, especially for a 1080p gaming. Experience is further enhanced by the 120 Hz screen, which utilizes the high framerates to deliver a super smooth image. The first values from the test are from the 30th second of running the Prime95 stress test, which simulates a heavy task run on your computer (usually lighter tasks take from a part of the second up to a couple of seconds). 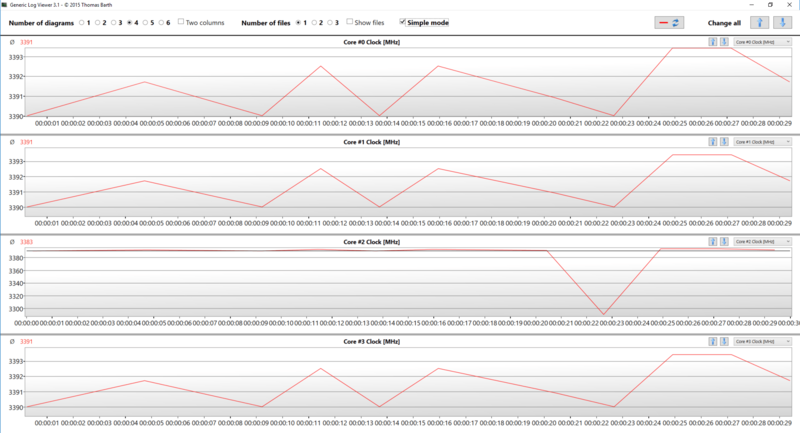 Next, we take the ones from the 2nd-minute mark, which imitates a very heavy task, run on the CPU. 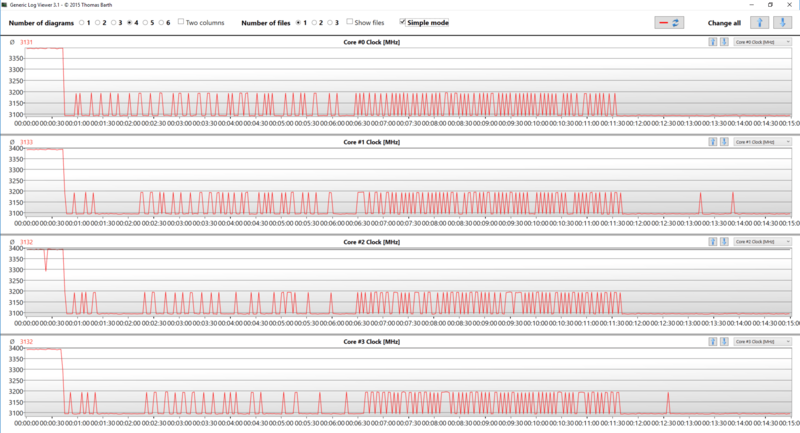 The last values we give you are the ones at the end of the test, which is 15 minutes, simulating the CPU load when it renders a video, for example. Prior to beginning our torture test the Intel Core i7-7700HQ inside this unit was idling at 42C. 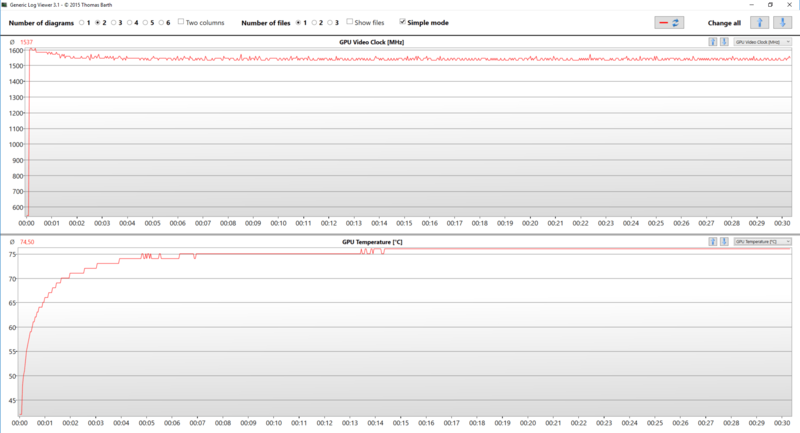 In the first 30 seconds, the frequencies were kept steadily at 3.4 GHz, while CPU temperature climbed gradually to 92C. Further, after around 10 seconds of the second checkpoint, the temperatures grew up to 94C. 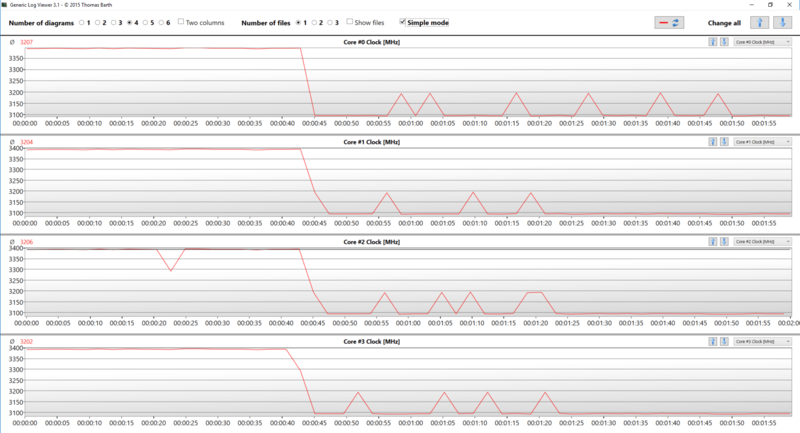 At this moment, the clock speeds went down to 3.1 GHz as temperatures also fell down to around 85C. Of course, the device became a little louder as fans sped up. 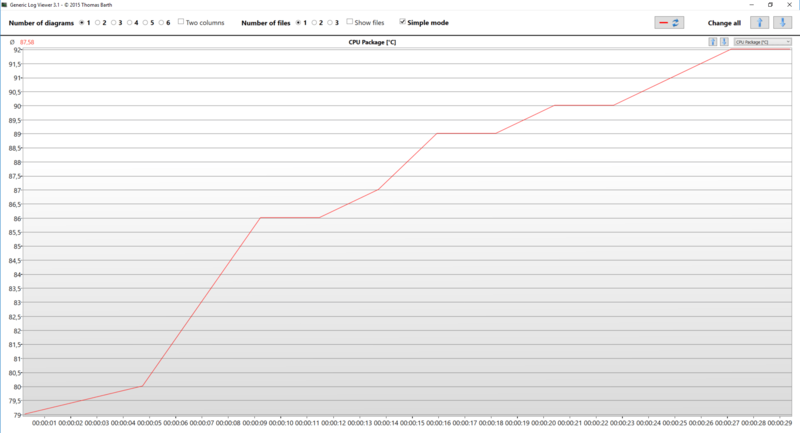 While Prime95 was torturing the Core i7-7700HQ, the CPU was capable of 3.1 GHz and on some occasions up to 3.2 GHz. 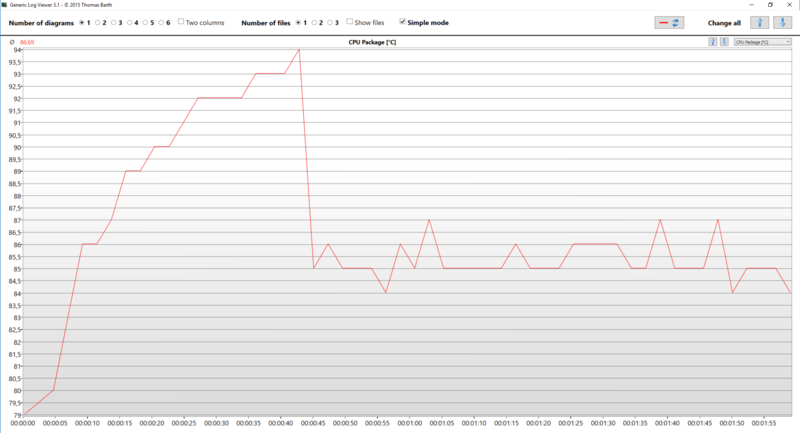 Temperature-wise, the device found its sweet spot at around 85C, balancing between fan and clock speeds to maintain it. While also idling at 42C, the GeForce GTX 1070 reached a maximum of 76C at an average frequency of 1537 MHz. 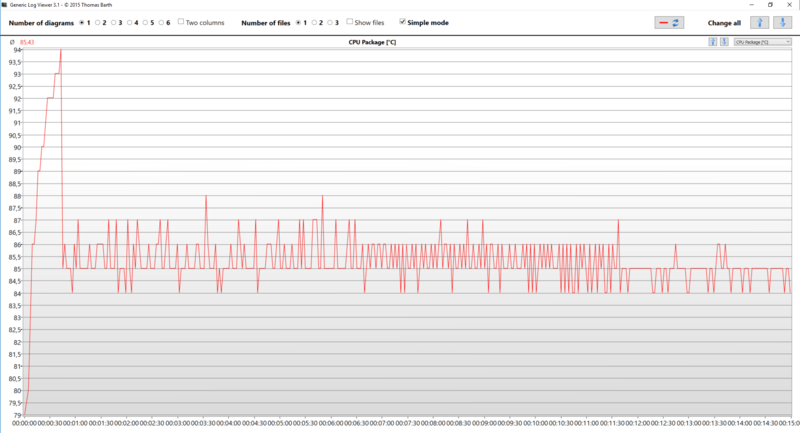 Strangely enough that frequency is higher than that on the 17.3-inch notebook, although the temperature is also higher. It’s worth noting that if you don’t mind the loud noise from the fans, you can press the dedicated button in the top right corner to get 100% cooling performance, which will help you utilize those extra 100 MHz from your GTX 1070. Temperatures on the surface were warm but surely not hot. Due to the allocation of heat pipes, the top part is far warmer than the bottom, which ensures a cool wrist rest area. There is also a lot of heat dissipated from the center of the keyboard as there is a GTX 1070 underneath it. MSI GE63VR 7RF doesn’t fall short of its larger brother in any aspect. Despite the size difference, not only it matches the GE73VR 7RF completely but in some cases, it excels in performance. It has been a while since we’ve liked almost every aspect of a device we test, but today we are certainly impressed by what we saw. Once again we encountered good build quality, reasonable dimensions, and relatively low weight. Most of our attention, though, fell upon the 120 Hz TN panel. Although it has poor viewing angles, the display pumps beautiful colors that with the help of our Gaming and Web design profiles become accurate enough for color sensitive work. This, combined with the super fast panel and PWM-adjustment only for low brightness levels at a high frequency (this can be completely fixed by the Health-Guard profile), make for an amazing display quality. Moreover, when you connect a 120 Hz screen to a GeForce GTX 1070 – magic starts to happen, as the display utilizes the higher frame rate and transforms it into an immersive gaming experience. Speaking of the GPU, this device is more than capable to cool down the beast. In longer gaming sessions we didn’t notice any severe drop in frame rates like we did when we tested the 15.6 and 17.3-inch devices of the Stealth Pro line-up – GS63VR and GS73VR respectively. This power-hungry monster makes gaming on a battery almost stupid as you’ll get a tad over one hour of gaming. There is something in this notebook that disappointed us – the battery life. Well, okay – it is meant for gaming, so it is not expected to give you a lifetime on battery, but after all, this is a portable device. Take the Alienware 15 R3, for example – it is loaded with a huge 99Wh battery. We think that a portable computer should provide you with more than just 3 hours and 44 minutes of web browsing that you get with this notebook. Not only that but this unit may not go through an episode of Lord of the Rings on a single charge… shame.